It's almost impossible not to love chimpanzees. Maybe we see something of ourselves in them, since they're one of our closest living relatives in the animal kingdom. Maybe you're a Planet of the Apes fan, fascinated by the discoveries of Jane Goodall or have a soft spot for Curious George. Despite popular culture's love of all things primate, the rarest type of our beloved chimps -- the Nigeria-Cameroon chimpanzee -- is facing a new threat to its survival, at the hands of an American company. 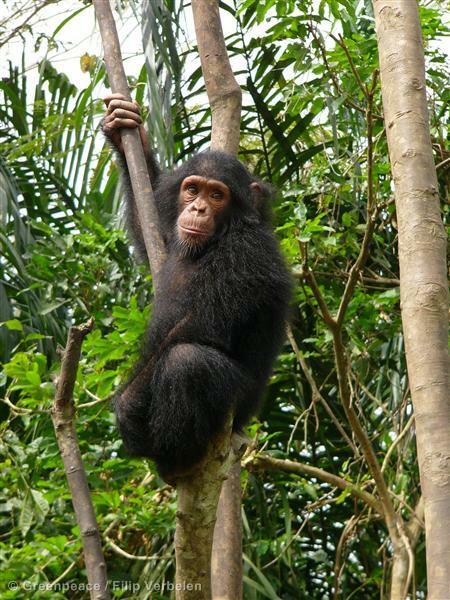 A scientific study by Dschang University released this month, found evidence that these rare chimps are living in an area of rainforest near Korup National Park in Cameroon, set to be razed to the ground by New York-based Herakles Farms. The company has been proposing a palm oil plantation that will involve destroying thousands of hectares of rainforest in a region identified as one of the top 25 hotspots for biodiversity conservation in the world. If you think "biodiversity hotspot" sounds like a science class or a commercial for a vacation destination, imagine this instead: The chimps living on land that Herakles Farms hopes to "develop" have as many forest friends as The Jungle Book's Mowgli: elephants, antelopes, monkeys of all kinds including the critically endangered Preuss's red colobus, and types of fish that are found nowhere else on earth. If this wasn't incentive enough to leave this area intact, scientists found a fish that could turn out to be part of an entirely new species; a little guy that fits in the palm of your hand, with a red shimmer around its eyes that would make any Sephora addict jealous. Palm oil is the world's cheapest edible oil, and increasingly one of the most popular. It's used in vast quantities as an ingredient in household products like shampoo, instant noodles, laundry detergents, cookies and cosmetics. You might not even know it's there, since palm oil can be hiding behind generic names like "vegetable oil." Millions of acres of ancient rainforest have been cleared in Indonesia to make way for industrial palm oil plantations. Now, developers are turning their attention to Africa, palm oil's new frontier, where they can buy land at exploitatively low prices, and play out the same sad scenario. Confirmation of internationally recognized endangered species in Herakles Farms' proposed plantation is in direct contrast with the company's depictions of this forest. It has previously claimed its project in Cameroon would convert an area of little conservation value. These new findings prove this to be far from true. To make matters worse, the project has also been developed without adequate consultation with the people who live there, many of who oppose the project and risk losing land that's been farmed by their families for generations. In the past, the U.S. Government has invested heavily in the conservation of the endangered Nigeria-Cameroon chimpanzee. It seems both tragic and ridiculous then that Herakles Farms, an American company, is set to bulldoze forest that's critical to the survival of these unique creatures. There is still time for the Government of Cameroon to reject Herakles Farms' plans. Let's hope, both for the villagers and for the chimps that live off this forest, that the Government is listening.